Today was the first real cold day of the season here in London, the weather was damp and windy and we really wished we had taken a scarf like the ones above with us. 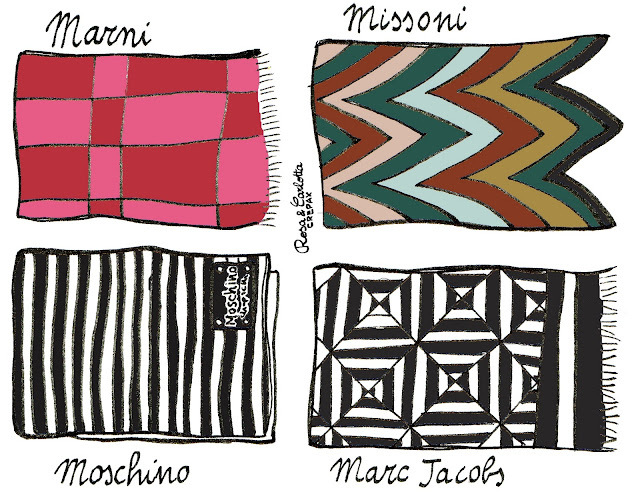 We have selected four scarves with geometric patterns, which one is your favourite? Oggi qui a Londra è stata la prima giornata davvero fredda della stagione, con clima umido e vento gelido e abbiamo fortemente desiderato una sciarpa calda come quelle che abbiamo disegnato. Abbiamo selezionato quattro modelli con stampe geometriche, voi quale preferite? oh gosh your blog is fantastic, I love it. It's sooooo original, I've never seen a blog like the yours ! La pashmina di Marni e' adorabile, mi sento scaldare gia' solo per i colori! Grazie per il commento sul blog, un bacio! anche se quella di Moschino mi sembra + versatile!! Love the one from Marni!!! @Rebecca grazie per il commento!! from Missoni is greattttt and I want it! wanna exchange link? or follow each other? I want the MJ's one!! LOVING YOUR BLOG, SO BAD! I adore your illustrations of current fashion items!